Overhead power lines are both a nuisance and a serious danger to the crews working on the pipelines. Each overhead in the ROW is marked with flags and poles, so that the lines are as visible as possible. 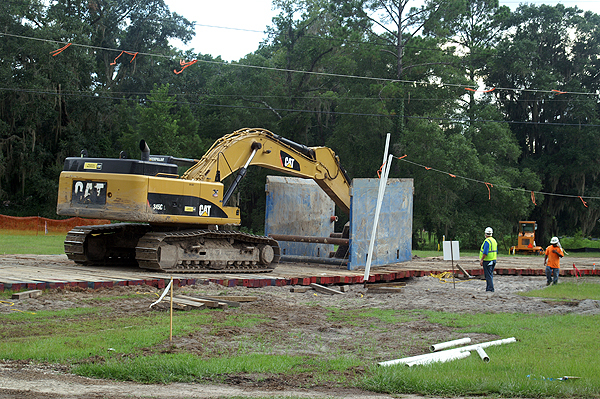 This excavator is moving a trench box. It can just rumble along carrying the box in the air. However, to go under the lines, the operator has to put the box on the mat road, flatten the arm out to make it as low as possible and push the box under the lines. It reminds me of crossing a barbed wire fence as a kid - running until I got to the fence, then slow down, slip under the fence with great care, and then running again. This entry was posted on Tuesday, June 12th, 2012 at 2:32 pm. It is filed under Corporate, New Images and tagged with crossing, mat road, overhead lines, pipeline, power lines, trench box. excavator, under. You can follow any responses to this entry through the RSS 2.0 feed.